A team member from Campus IT support is cycling their way through more than 1,400 miles’ worth of routes this year, to raise money for cancer research. Simon Green, IT Support Assistant in Campus IT Support West, will initially take on the 112-mile Fred Whitton Challenge on 12 May 2019 – a route that totals of more than 3,900 metres of climbing, taking in five of the UK’s hardest mountain passes including Kirkstone, Honister, Newlands and finishing with the brutal 33% gradient Hardknott & Wrynose Passes. Later in the summer, he’ll be covering 1,000 miles in one week, and on another day he is set to cycle from Nottingham to Brighton – a distance of 200 miles. 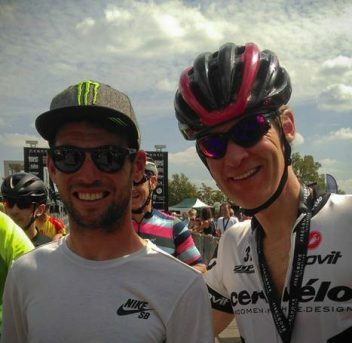 Finally, he will be taking part in the 95-mile ‘Rise Above Sportive’ event in August, where he’ll be cycling in a team alongside event organiser Mark Cavendish. Simon is fundraising for Macmillan Cancer Support, and has currently raised nearly £2,000 for the charity this year throughout sponsorship of the events. Details can be found on his JustGiving page.